Make a vintage sailing ship birthday cake for kids and bring a shipload of fun to any kid's birthday party. This simple cake design is perfect for both young sailors and pretend-to-be sailors depending on how clever you decorate it. It's easy to make and assemble. Simply follow the step-by-step instructions and photos, and you'll have wonderful results. 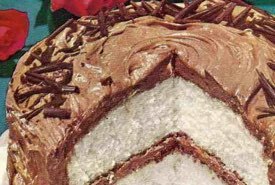 Choose one of the homemade white cake recipes on this site or try my Aunt Wilhelmina's Chocolate Cake Recipe if your child loves the taste of chocolate. Bake a 9-inch square cake of whatever flavor is desired, having first cleaned and wrapped coins in waxed paper and placed them in the cake batter for the ship's "treasure." When cool, cut the cake diagonally in half to make two triangles as illustrated in fig. 1 below. One triangle is the large sail. From the other triangle, cut off a strip 2-1/4 inches wide to use for the ship's hull. 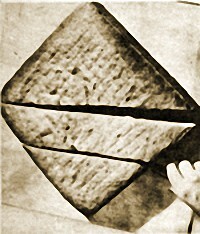 Arrange the cake pieces on tray as illustrated in fig. 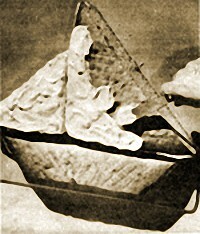 2, using the small triangle as the ship's second sail. 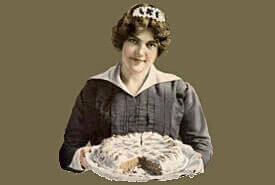 Choose one of Grandma's old fashioned Icing Recipes to make delicious homemade frosting for decorating the cake. 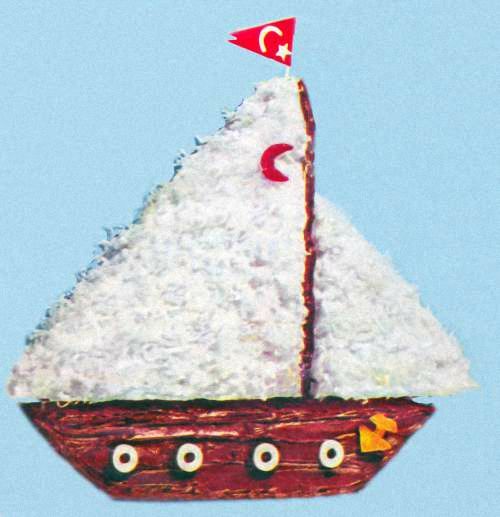 To decorate the birthday cake so it looks like a sailing ship, spread white frosting on both sails, then sprinkle on white shredded coconut, if desired. Spread chocolate frosting over the hull, or another color if preferred. Put a line of chocolate frosting between sails for the mast or use a black licorice strip. White Lifesavers® candies make the portholes. Cut the anchor and crescent for the sail from colored gumdrops or paper. Finally, make a paper nautical pennant, fasten it to a toothpick or straw, and add it to the large sale to top off your ship. Make sure any coins are thoroughly clean before wrapping them in waxed paper and placing them in the cake batter, or on the cake's surface beneath the frosting. Try to position them so everyone gets a coin when the cake is cut. It's also fun to strew a generous quantity of chocolate coins in gold foil around the cake as party favors. Kids love to find the chocolate coins, and they remove the danger of having actual coins in the cake. It's loaded with "treasure" and ready for fun eating. The old custom of hiding coins such as quarters in cakes, though lots of fun, can present a choking hazard and the potential for someone breaking a tooth. Do not hide coins in the cake if young toddlers will be eating it. Make sure the children are old enough to understand the risks, and always announce the cake's hidden "treasure" before serving. 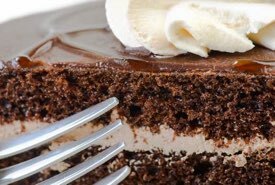 The kids will love digging through their piece of cake looking for treasure! Always count the coins beforehand, and make it the rule that no child eats until ALL the coins are found! Simply follow the easy instructions and pictures, and you'll have a fun cake that you'll enjoy presenting to your child. They'll love it and love you for making it. The sailing ship birthday cake will serve 9 to 12 youngsters. If you're planning a larger party, the ship pattern is simple enough that you could easily make enough for two cakes. Arrange the cakes side by side on a platter as though they are racing. Or, an extra large square cake pan could be used to make an even bigger cake such as you might need for a kid's sailing club party. Everyone will love the nautical design and homemade taste of this vintage party cake. Mom made this sailing ship birthday cake for my party when I was a youngster back in the 1950s. My friends and I loved it so much that I asked her to make the same cake again the following year. And she did! This vintage birthday cake will bring joy to any child, especially when it's laden with valuable "treasures" to discover. It's also the perfect little cake for a lakeside picnic or a theme party. Just release your creativity.